Corbett Lunsford New PBS Show "Home Diagnosis"
Tip of the Week What color of bulb should you use? Clutter Clarity, What is in your junk drawer? Tip of the Week, Are Space Heaters Safe? Clutter Clarity, What receipts should you save? Clutter Clarity, Are you ready to downsize? Clutter Clarity, What qualifies as old food? Clutter Clarity, Is it time for a fall cleanup? Clutter Clarity, Do you need to move clutter? Mr Floor, What is a sleeper under my wood floor? Clutter Clarity, Paper taking over your house? Tip of the Week Do I need 3 Bids or Maybe More? Clutter Clarity, What CAN'T you throw away? Steve Zamborski from NAPCO Tub refinishing and..
Clutter Clarity, Can you drink "Old" beer? Tip of the Week - No Such Thing as a "Deal"
Clutter Clarity Too many papers to sort through? Remodel Workout Program you can pay for? Tip of the Week, How does heat move? Tip of the Week, Where do we start a remodel? Tip of the Week - What is a Tiny House anyway? Tip of the Week - DIY Problem? Where do you turn? Tip of the Week - What is in your roof? Tip of the Week, What does a permit do for me? Tip of the Week, What do you need in a Safe? Tip of the Week, What is it a Deck or Patio? Tip of the Week, What is in your contract? Tip of the Week, New colors to use. No more Gray!! Clutter Clarity, What is in your Medicine Cabinet? Tip of the Week, How Does Heat Transfer? Clutter Clarity, Hats, Scarves and Gloves Oh My! Clutter Clarity, Testing a Pan Cleaner? Tip of the Week, What do you need for the storms? Tip of the Week, Do you NEED Flood Insurance? Steve Bernas, Is the BBB still Relvant? Clutter Clarity, Do you really need free stuff? Tip of the Week What type of caulk do you need? Tip of the Week What is a house wrap for? Tip of the Week, What's the Inspector looking for? Mr. Floor, Flooring options that are "Green"
Clutter Clarity, What does an organizer really do? Tip of the Week, Is a free window really free? Tip of the Week, His or HERS rating saving money? GAF Roofing Master Elite Roofing Contractor Art F.
Mighty House Green House, Extended Growing Season? On the Flip Side, Beth Franken, Flipping a house? Clutter Clarity, Are you really going to use that? Jesse Kalsi, What does your home number mean? Clutter Clarity, Saving Receipts for? Tip of the Week, what kind of door hinge is that? Clutter Clarity, Save those Magazine? Clutter Clarity, How many spices do you need? Mighty House Green House Flower Buds in Dec? May 16th 2015 Sears Service Interview W/Barry B.
Oct 18th 2014 What is your "Green Home" worth? Funny, friendly experts with serious answers and great ideas to help with all of your home improvement projects. 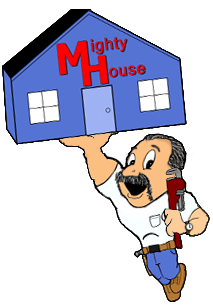 Join Ron Cowgill, along with Rich Cowgill, Robbie Erhardt and the Mighty House® team each Saturday morning and get help with all of your home improvement and repair issues.